Homing Requirements: Peggy needs a family who can put her needs first and offer her a training course to support her learning and settling process. Peggy could be an only dog within a family or would join another dog or pack: she needs a social setting as she is naturally social. Peggy is not for cats. feathers or furries. Peggy would enjoy a secure garden or area she can enjoy off lead exercise. 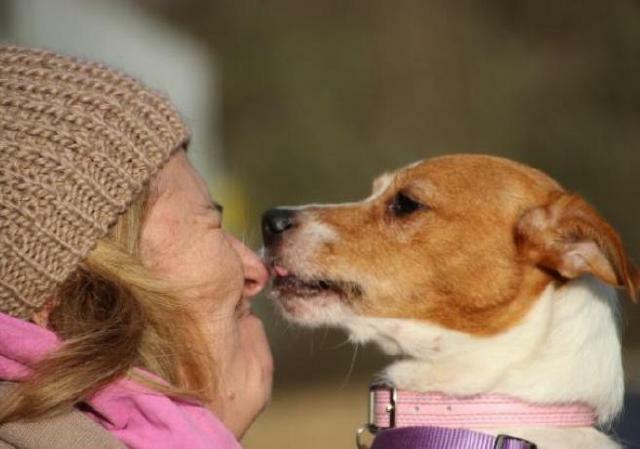 Her Story: Peggy was found stray / abandoned in December and unclaimed. We have since neutered, chipped and 1st vax'd her. Peggy is has been in kennels but enjoyed a 10 day break over the Christmas holiday period in with a pack of Jack Russells. Temp fostered and then kennelled near Gatwick. 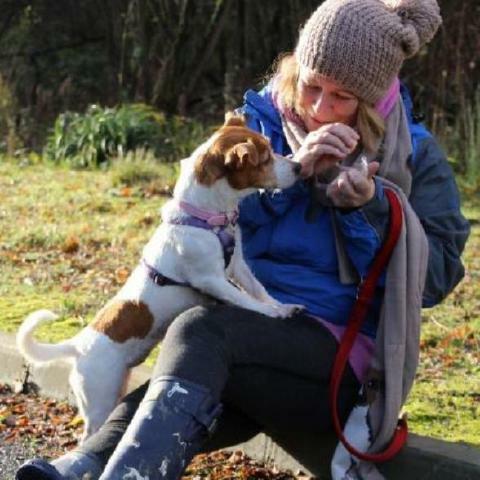 Advert: Peggy is a very conversant Jack Russell who delight in human and canine company. Peggy is too curious and interested in 'additional pets be the fur or feather. She is a little shy of children but would settle given support with dog savvy children as she has no spite and isn't a nipper. Peggy is housetrained and enjoys access to the furniture. She will snuggle down into blankets and is happy to sleep curled up with friends. Peggy doesn't pull on the lead and isn't to involved in dogs on her walks; she is enjoying her walk and taking in smells; sounds and visual information...very happily! 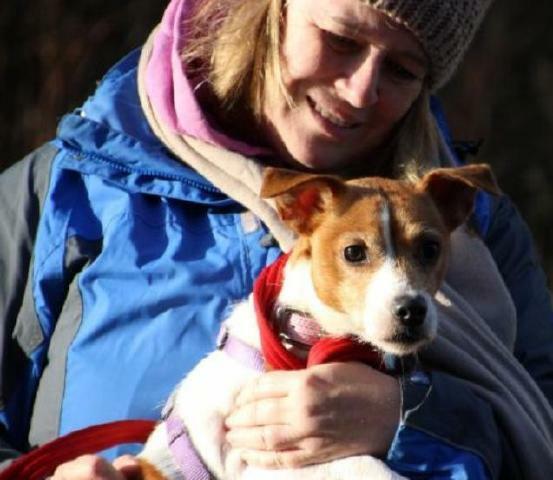 Peggy is a short legged; short haired; white & tan Jack Russell. She is in good health and about 2 years old at a guess. Peggy hasn't been ill treated and has no conflict over sharing space and food. 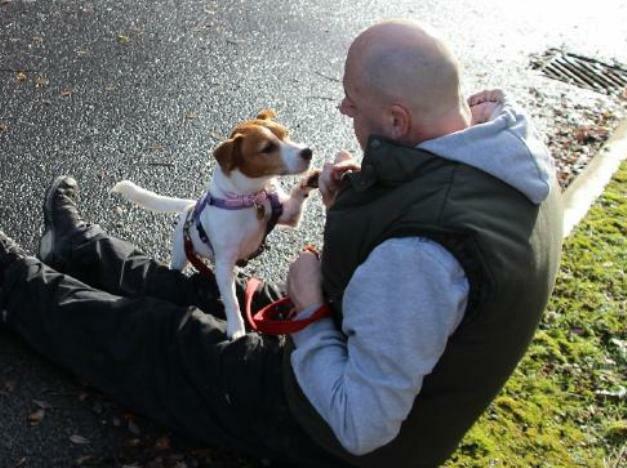 An 'easy peasy' Jack Russell in our books which make her a 'Must Have' sweetheart. Interested in homing Peggy? Please click to complete our on-line homing questionnaire to match a suitable dog with your lifestyle. Peggy came into our Rescue on Tuesday the 10th. She was spayed, chipped and 1st vax. 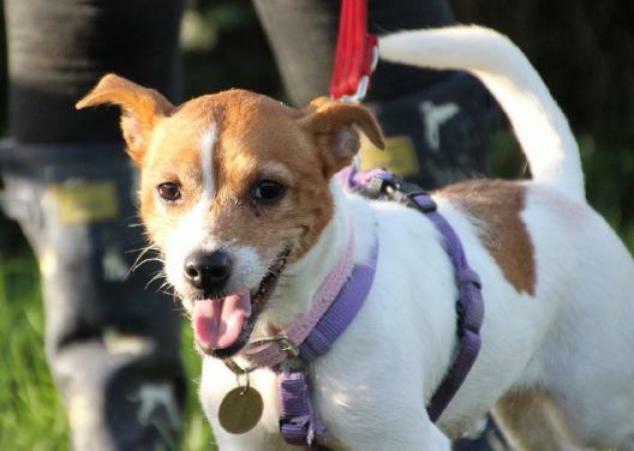 Peggy is a delightful short legged, smooth coated white and tan Jack Russell. She will be very popular in the Rescue!! !